Reports on Monday claim that Microsoft is planning to release three new Surface tablets in 2013, and that the company could ditch Intel and Nvidia as its chip makers of choice. The latest Surface leak came from the Twitter account @MS_Nerd, a source that forward-looking tech blog NextPowerUp called "fairly reliable." Microsoft is reportedly planning follow-ups to the Surface RT and Surface Pro tablets, plus a third device called the Surface Book, for as early as next year. And according to the rumor, the second-gen Surface and Surface Pro tablets will carry Qualcomm and AMD processors, respectively. Monday's leak may have revealed some surprisingly specific details about Microsoft's future plans for its new Surface tablets. The new Microsoft Surface RT 2 will feature a smaller 8.6-inch display and run a Qualcomm chipset (possibly a Snapdragon), while the Surface Pro 2 with the full Windows 8 OS will come in at 11.6 inches with a chip from AMD's "Temash" line of quad-core APUs, according to the day's reports. Microsoft's rumored Surface Book, on the other hand, will sport a 14.6-inch screen and possibly even a solid keyboard and trackpad, making it a powerful transforming tablet/ultrabook hybrid. Microsoft could stick with Intel for the Surface Book, as the leak claimed that the third new Surface device will pack Intel's upcoming Core i5 "Haswell" processor. SlashGear brought up the fair point that the AMD Temash and Intel Haswell chips aren't even scheduled to launch until some time in 2013. 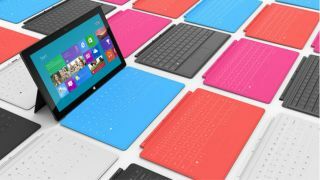 Further, the first-gen Microsoft Surface Pro release is expected to occur in January. As such, even if reports about the three new Surface tablets prove accurate, the devices likely won't launch until late 2013, and no doubt there are months yet to go before Microsoft begins talking about them. Even then, sources recently claimed that demand for Microsoft's Surface is weak, so the success or failure of the Surface Pro in January could determine the future of Microsoft's line of tablets. For more on the Microsoft Surface, check out TechRadar's Microsoft Surface vs. iPad 4 comparison and the rumors of a Microsoft Surface Phone that popped up in November.